Who can resist that waterfall countertop? 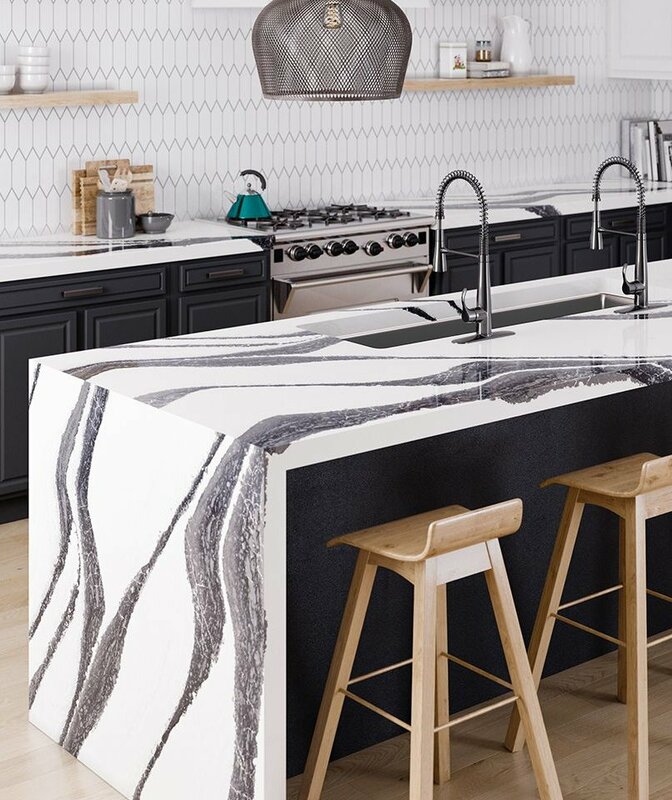 From the trendy waterfall countertops spotted in Mandy Moore's kitchen remodel, to stunning engineered quartz that's now more popular than granite, we can't help but take notice whenever a beautiful kitchen countertop is involved. With our Instagram feeds flooded with pretty kitchens, it's not just the kitchen cabinet colors that are making us swoon—but also the marble, engineered stone, and butcher block counters. From a timeless style you'll want to live with forever, to an of-the-moment look that wows, we've rounded up five of our favorite countertops and matched them up with the homeowner or remodeler they'd be the best fit for. No matter if you're in search of a Fixer Upper-style kitchen or a sleek, modern cook space, there's a countertop here that will make you want to remodel. A high-tech hybrid of quartz, porcelain, and glass, Dekton is a newcomer to the countertop industry, first introduced in 2013. Trilium is one style of Dekton countertop, which has the look of rusted metal, yet is surprisingly smooth to the touch. Interior designer Wendy Glaister used the eye-catching material in the kitchen above photographed by Mark Verschelden, making the kitchen island the focal point of the room. For those who want a countertop that doubles as a conversation piece and adds industrial charm to their space, turn to this unexpected material. Bonus: It's durable and won't have to be resealed like other stone countertops. Waterfall kitchen islands are a luxurious trend that demands attention, as demonstrated in the kitchen above designed by Lindsey Bochard of Lindsey Brooke Design and photographed by Amy Bartlam. To make the 12-foot island as functional as possible, Bochard outfitted it with drawers, lower cabinets, and even a second sink. If you decide to splurge on a waterfall island for your next kitchen remodel, follow the designer's lead and be sure to make the island as practical as it is pretty. For a modern farmhouse kitchen, follow Joanna Gaines's example and opt for butcher block countertops. Take a cue from the kitchen above by Sarah Sherman Samuel and pair wooden countertops with clean white cabinets and open shelving. Want to really nail the farmhouse aesthetic? Don't forget the apron-front sink. Recently, concrete countertops (and even concrete farmhouse sinks) are growing in popularity, and after admiring Baubles & Backdrops beautiful countertop above, it's easy to see why. The material may make you think of industrial style, but modern concrete countertops can be dyed a range of colors, so you don't have to stick with the classic gray. Even if you have your concrete kitchen countertop professionally installed or poured in place, you can typically customize the color and finish, making this a great option for those who want to create their own look.